While the 9mm is making a hearty resurgence in law enforcement circles, .40 S&W is still the most prolific chambering for police sidearms. It is the .38 Special of the modern age. A prominent Austrian firearm manufacturer reports that they own 65% of the U.S. police market, and I’d wager that most of those would be their models 22 and 23. 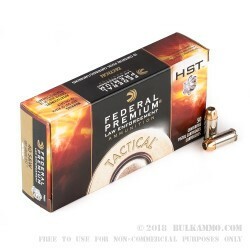 Federal Premium is a major ammunition manufacturer, employing some 1,100 employees and is the brains behind the operations at the Lake City Army Ammunition Plant in Missouri. They have been at it for over a century and are going strong. 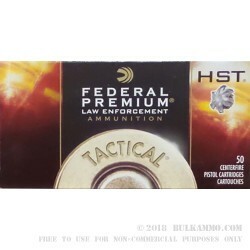 Marketing to law enforcement is a major component in Federal Premiums business model, which includes the popular line of HST hollow points. The 180 grain HST hollow point boasts muzzle velocity of 1,010fps, with muzzle energy of 408 ft/lbs. In the standard FBI test protocol, this loading penetrated 12” in bare gelatin, retaining 100% of its mass and expanding to .960 which creates a terrific wound channel. The HST .40 S&W JHP expands tremendously through almost all surfaces, and retains weight really well through most of them. Expect this load to hold zero at 25 yards, drop 1.4” at 50 yards, drop 5.1” at 75 yards, and 11.4” at 100 yards; let’s hope that you never have to engage a target at those distances with a handgun! 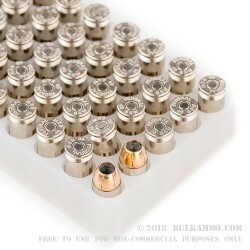 If you are buying for your department, get in on this deal while it is still available; buying in bulk offers the best bang for your buck, reducing the price per round by several cents each which adds up a lot over the course of a thousand rounds. I've been carrying HST's for many years now. 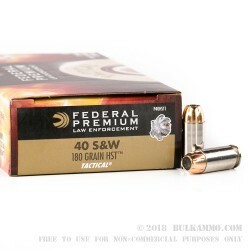 Federal LE ammo is always top notch. The HST's are the what evolved from data gathered after many years of Hydra-Shok's. I've carried and used both. Trust and rely on them for my EDC. 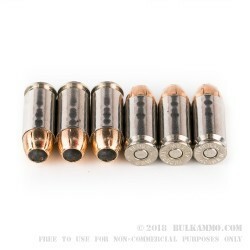 Think quality of this ammo is good... a little high on the price but I guess that's normal for ammo of this grade. Overall GREAT BUY.